English: Flag of Georgia, taken from the xrmap flag collection 2.7. The flag's colors have been corrected based on an image found on the Georgia Secretary of State's Web site. 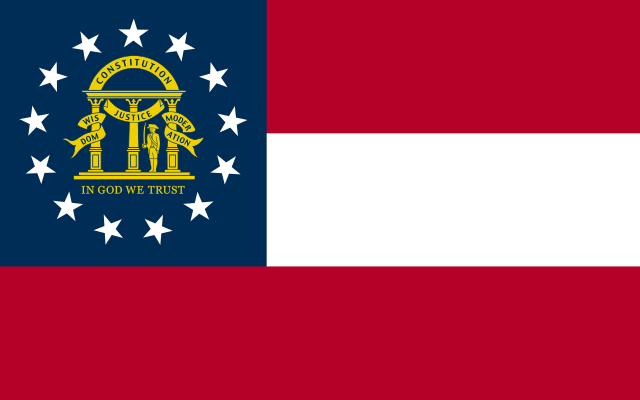 The font face of the phrase "IN GOD WE TRUST" has been changed to w:en:Times New Roman, since that matches the Georgia Secretary of State image. 2007年9月7日 (金) 19:33 6,912 × 4,320 (87キロバイト) Zscout370 Updating dimension in the canton; the state shows the soldier not colored with orange and green, but in gold. 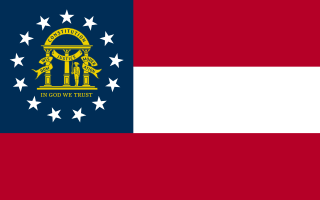 2006年3月20日 (月) 14:48 662 × 398 (108キロバイト) Hoshie Updated flag of Georgia (US) with proper colors and the font of the motto has changed.